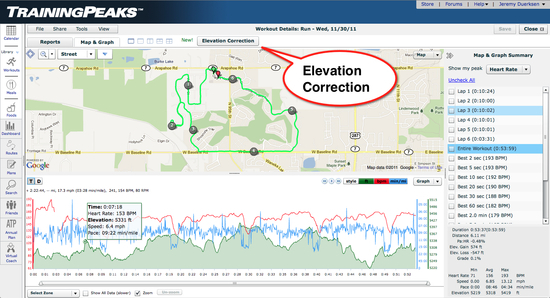 Elevation Correction is a feature on TrainingPeaks.com, allowing you to apply correction to your GPS workouts. As good as GPS devices are for tracking speed and distance, they suffer in the ability to record accurate elevation data. This is just an inherent limitation to GPS technology. Without the ability to read signals from satellites above and below your position on Earth, the elevation reading is susceptible to significant error due to the nature of the math being used to calculate your coordinates. However, we’ve come up with a simple solution to this problem. We’ve combined several surveyed datasets into our own worldwide, proprietary database whereby we can take your horizontal position and match that up with the elevation data from our database. In almost every case, this results in more accurate elevation calculations, especially for hill slopes and calculations of absolute elevation gained/lost. To access this premium-only feature, open up any workout where you’ve used a GPS device and open the “Map & Graph”. At the top of the screen is a new “Elevation Correction” button. 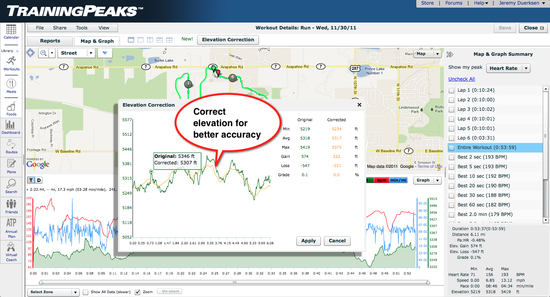 Once launched, you can see a preview of the new elevation profile compared to the one recorded by your device. Because in some circumstances the corrected elevation data may not be as accurate, you can choose to apply the corrected data or ignore it. Applying the correction causes your screen to refresh with the new data. This works for any premium account user, on any file recorded with a GPS device. 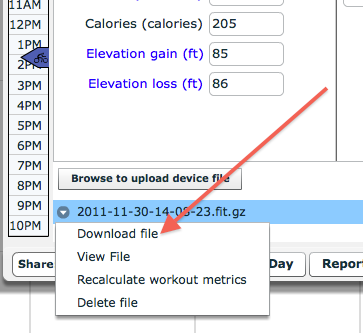 If for any reason you want to get your original data back, just download the original file from the QuickView as shown below, and re-upload the file back to the workout. Elevation correction is available to all premium TrainingPeaks.com subscribers. If you are a WKO+ user and you download from TrainingPeaks.com into WKO+, you will be getting the corrected data if the elevation correction has been applied.